Hot Bread Kitchen envisions a food system that equitably compensates talent and sustains a diverse workforce while celebrating culinary tradition and innovation. 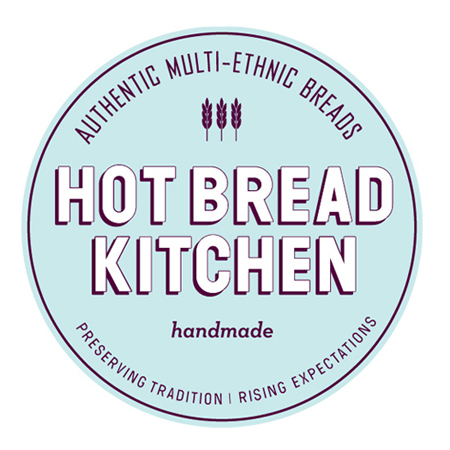 The flash of inspiration for Hot Bread Kitchen came from a slip of the tongue. In 2000, founder Jessamyn Rodriguez interviewed for a job at a microfinance organization called Women’s World Banking. When she explained the opportunity to a friend, he misheard the organization’s name as Women’s World Baking. Forget banking — the missing letter conjured up a vision of an international women’s baking collective that stuck. Fast forward seven years: Jessamyn, after a decade of social justice and public policy work, is now a baker. She launched Hot Bread Kitchen’s Bakers in Training program out of her home kitchen in Brooklyn. Their non-profit social enterprise marries market to mission: 65% of our operating budget is funded through bread sales and kitchen rental. Essential philanthropic support makes it possible for them to provide industry-specific training and educational programming to benefit our clients. All of their breads are incredible too!